Ready to promote your self-published book at your local library? Better have a plan! Library event coordinators are fabulous supporters of the arts, but they’re not always an easy sell for new authors. 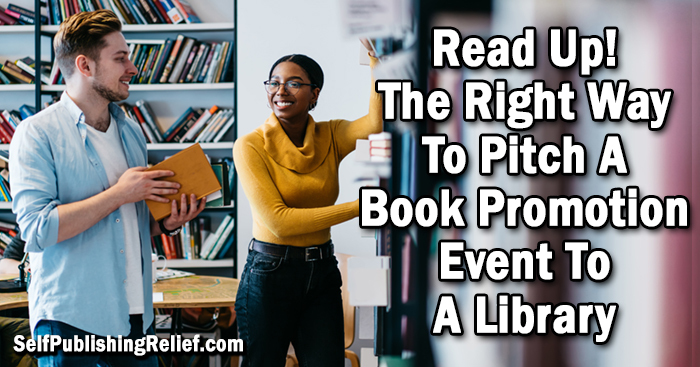 Self-Publishing Relief gives you the tips that will make more librarians say YES to your promotion ideas! Author reading with a Q&A. The most basic promotional event is an author reading, which is just what it sounds like: you, reading a passage from your latest self-published book. After the reading, Question and Answer time with the audience is de rigueur. Public readings involve little prep (Hooray! More writing time! ), and for audiences, the takeaway of attending a reading is—basically—bragging rights (Guess who I met in person at the library yesterday!?). However, unless you already have a lively following, a simple author reading might not fill seats. Educational seminar. Local audiences unfamiliar with your writing might turn out to meet you if you tempt them with a seminar that draws on your expertise as a writer. Your seminar might be “How To Get Published” or it might be related to the subject matter of your book. Bonus points if you can work a local angle into your talk. Here’s how to come up with a seminar/lecture/talk/workshop idea. Local author panel. Maximize your outreach and cross-promotional potential by rounding up a few of your fellow local authors for a lively author panel discussion. A moderator can help facilitate your chat with preloaded questions. Booklovers who show up to meet and greet one author on the panel might buy books from other panelists too. Plus, with more authors to promote the event in advance, you may be more likely to fill seats. Learn more about connecting with other authors. Pitch in person. Use the library’s website to research the name of an event coordinator, then reach out for a face-to-face appointment. Your odds of success rise when the library coordinator sees how personable and enthusiastic you are! Pack a promotional gift basket. Bringing a small gift basket of assorted items related to your book can pave the way for a great partnership. Things to include could be: copies of your book, promotional bookmarks or rack cards, digital goodies, or gift items (like candles with scents related to your book’s location). Learn more about how to create a gift basket to promote your book. Summarize your event. Write a one-page summary about the event you’re pitching (with emphasis on audience takeaway value). Your summary might also include alternative talks that you’re willing to give just in case a similar event is already on the library schedule. Be sure to include a great headshot and an impressive author bio as well. Finally, include any social media or mailing list numbers, along with plans for local promotion, to indicate that you’ll be helping to promote the event—as opposed to relying solely on the library’s PR efforts. Include a press release. Librarians might be more inclined to get into the spirit of your talk when they discover an already written press release that will a) get them excited about your event, and b) indicate that they won’t have to write a press release when promotion time comes—because you’ve already done it! Follow up. Be sure to let the events coordinator know that you’ll follow up in two weeks (or other appropriate time frame) to see if you’ll be able to work together. Then, be sure to send a thank-you note, regardless of the outcome. By following these simple steps, you’ll make a better impression on the library event coordinator and boost your chances of holding your event at the library. And hopefully, the result will be more fans of your writing and more books sold! Question: Have you pitched or hosted a talk at a library? What’s your best tip?